I first saw this recipe over at Pinch My Salt earlier this week. It looked amazing, and I couldn't believe that this recipe came from The Bread Baker's Apprentice - I've had this book for over a year, and I never noticed this recipe in there. Once I knew about it though, I couldn't wait to make it. I picked up several ears of super fresh corn at the farmers' market this morning and decided to make the bread right away. I wanted to make it for dinner tonight, so I wasn't able to soak the cornmeal overnight as the recipe instructed. 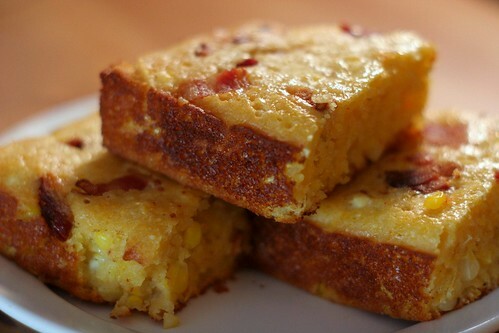 The bread was still wonderful though, packed with fresh corn kernels with lots of bacon on top. I've come to expect great things from recipes in The Bread Baker's Apprentice, and this definitely didn't disappoint. If you've got access to some fresh local sweet corn, this is a perfect way to use it. I actually intended on making it with white whole wheat flour, but I forgot and used all-purpose by mistake. Nicole at Pinch My Salt used whole wheat pastry flour with success, so there are definitely some few options if you prefer a whole grain flour. Also, if you are a vegetarian, omit the bacon and use vegetable oil instead of bacon fat to grease the pan. The night before baking the bread, stir together the cornmeal and buttermilk in a mixing bowl. Cover and soak overnight. (If you don't have time to do an overnight soak, a few hours will suffice, but the bread might be a bit grainier in texture). The next day, preheat the oven to 375 deg F. Place a rack on a sheet pan, and lay bacon strips on the rack. Bake the bacon in the preheated oven until crisp, about 20 minutes. Remove bacon pieces to a paper towel-lined plate. Reserve 2 tbs bacon fat and discard the rest (or save for other uses). When bacon strips are cool enough to handle, crumble or chop into coarse pieces. Sift flour, baking powder, baking soda, and salt into a large bowl. Stir in the white and brown sugars. In another bowl, lightly beat the eggs. Dissolve the honey into the melted butter, and then stir this mixture into the eggs. Add this to the soaked cornmeal. Whisk the met mixture into the dry ingredients until well combined and smooth. Stir in the corn kernels until evenly distributed. Place 2 tbs of bacon fat or vegetable oil in a 10-inch round cake pan or 9-by-13-inch baking pan. If using bacon fat, place the pan in the oven for about 5 minutes, then carefully remove pan and tilt so that fat spreads and the pan is evenly greased. Pour batter into the pan and sprinkle the bacon pieces over the top, gently pressing them into the batter. Bake at 375 deg F for 30 minutes, or until a toothpick inserted in the center of the bread comes out clean. The bread should be firm and springy, and the top should be golden brown. Allow bread to cool in the pan for at least 15 minutes before slicing and serving. Bread is best served warm. Marking this recipe to take advantage of the last few weeks of fresh corn!